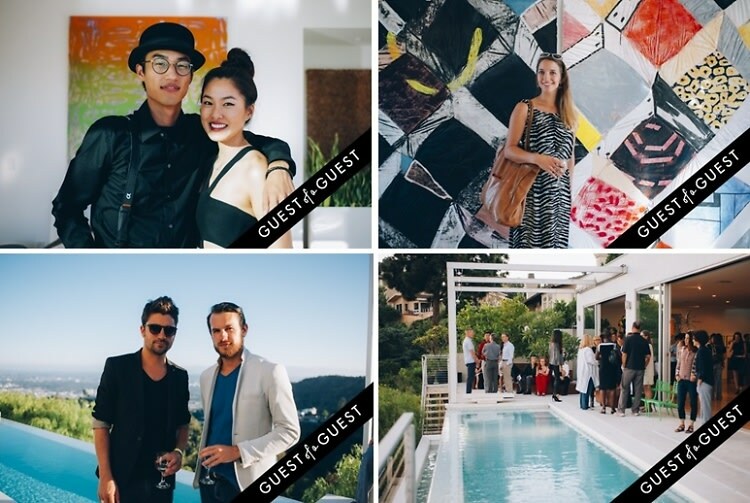 L'Art Projects debuted its second exhibition, À la Mode: Painted Method, this past weekend at a beautiful private home in the Hollywood Hills. The exhibition featured artists Erin Morrison, Jonathan Apgar, Ben Sanders, Molly Larkey, Ross McClain, Jake Longstreth, and Samantha Thomas, all of whom were in attendance. Collectors and guests snacked on mini apple pies and sipped Prosecco over conversations with curator Jennifer S. Li and the artists. Highlights included Jonathan Apgar's light-filled, multi-layered canvases, Ben Sanders' colorful and textured pop paintings, and an abstract sculpture by Molly Larkey that was specially commissioned by L'Art Projects. Recent UCLA MFA graduate Erin Morrison made a powerful showing with 3 large-scale, plaster-faced works in addition to a series of spray-painted stencil drawings. Samantha Thomas, featured last year in Art in America, stunned audiences with a salon-style hanging of nine small works, as well as a 3-dimensional wall hanging that was activated with light and shadow as the sun went down through the course of the evening. "Another great show!" said Winnie Lam, founder of L'Art Projects. Go HERE for more photos by Tiffany Chien and tag yourself and your friends!